Chris Emdin will deliver the 19th annual Mary Frances Early Lecture. Emdin is an associate professor in the Department of Mathematics, Science and Technology at Teachers College, Columbia University, where he also serves as director of the Science Education program and associate director of the Institute for Urban and Minority Education. He created the #HipHopEd social media movement and advises numerous international organizations, school districts and schools. He is the author of the award winning book Urban Science Education for the Hip-hop Generation and the New York Times bestseller For White Folks Who Teach In the Hood and the Rest of Y'all Too. Emdin holds a Ph.D in urban education with a concentration in mathematics, science and technology; masters degrees in both natural sciences and education administration, and bachelors degrees in physical anthropology, biology and chemistry. 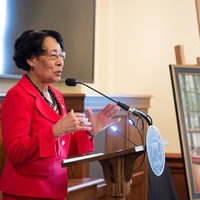 Each year, an invited speaker delivers a lecture that honors the quiet determination and dignity with which Mary Frances Early pursued her efforts to ensure that the state’s flagship university became an institution of higher learning for all people in Georgia. The annual lecture demonstrates the progress that has been made while also recognizing that work still remains in order to fully realize her vision. This lecture is sponsored by the Graduate School, Graduate and Professional Scholars, and the Office of Institutional Diversity. I had both students and colleagues with me in attendance yesterday. It was an extraordinarily powerful lecture. Is there any chance that the video of Dr. Emdin will be available?